It takes a village to raise a child. And it takes a team to raise a tent—at least in the case of a challenging, vanguard installation atop a nine-story building in the center of Manhattan. 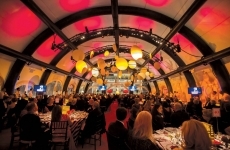 Carnegie Hall, the renowned music auditorium, wished to hold its opening night gala under a tent on its rooftop. Installation was the question. Boom trucks on the city streets were not allowed, as was the possibility of contact with any of the historically-preserved building’s surfaces. Add in the challenge of delivering it with no existing loading dock nor generously-sized freight elevator, and that it had to be aesthetically appealing, easy to install and cost-effective. “We went to them with a solution that was easier to fit into the necessary elevator, and one which came in at a more reasonable cost—and they jumped on it,” explains Collin Touhey, CEO of Pvilion, Brooklyn, N.Y., the firm that won the contract to design, engineer and produce the unique tent. Pvilion’s people went to work to partner with Anchor Industries Inc., Evansville, Ind., for the tent top; Stamford Tent & Event Services Inc., Stamford, Conn., to handle installation; and Federal Fabrics-Fibers Inc., Lowell, Mass., to create the vanguard device that made the whole endeavor possible: a fabric airbeam to hold the structure up, without the need for metal supports, which couldn’t squeeze into the elevator nor be boomed up, and which would have driven costs through the roof. “We started with a situation which seemed very costly: to create a tent on a roof,” Touhey explains. “The solution we presented was not to use aluminum beams, but fabric beams inflated with high-pressure air. It would be not only practical—easy to install—but beautiful and inviting. Such high-pressure technology had been developed by us for the U.S. Army 20 years ago, but this would be the first time the device would cross over into commercial use.” And if it succeeded, it could revolutionize the possibilities of the tent-rental market. Federal Fabrics-Fibers, which constructed the beam, has long had the Army as a client, using the technology to provide chemical/biological protective units since 1998. The U.S. Army has been interested in inflatable shelters for a long time, says Jean Hampel, team leader of the fabric structures team at the Natick Soldier RD&E Center, Natick, Mass. Tents, for example, need to deploy quickly with minimal personnel. The problem that plagued the Army for years was finding the right technology to prevent structures from collapsing overnight. In the 1960s, fans had to be used to constantly help the structures maintain air. Heat-welding technology was used in the 1980s, but the seams it created could not stand up to any weather. “Wherever you have seams, that’s a place to have air leakage,” says Hampel. The fabric chosen was a high DSP (density-stable polyester). “It’s our standard material, a proprietary weave poly. It’s best for the job because it’s extremely flexible once composted to an outer coating layer and can handle dynamics like wind movement,” he says.